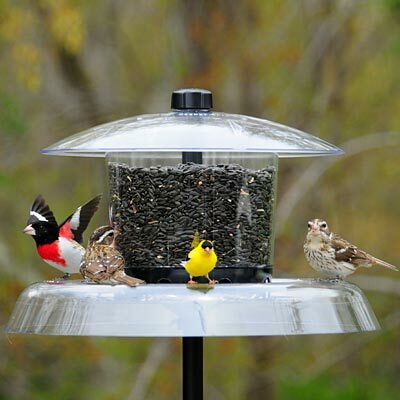 Provide a wealth of seed to all your feathered friends with the Droll Yankees Jagunda Squirrel Proof Bird Feeder with Pole. This hardy, generous unit offers quality, versatility, and ease of use like no other feeder. An expansive, 18.5" diameter seed tray rests on the included steel pole, acting not only as a feeder base but also as a baffle, preventing squirrels from reaching the seed. A round, seed reservoir rests on this tray, holding up to 6.5 quarts of cracked corn, mixed seed, or sunflower kernels for a wealth of birds to dine. The center of this reservoir points slightly upward, forming a baffle which helps direct seed to each of the eight ports, for complete emptying. Move the gray port ring to align or slightly offset with each opening on the hopper, to accommodate different types of seed for even more feeding options. The metal pole runs through the center of the feeder for extra support, and a 15" diameter cover completes the unit. This clear, polycarbonate dome helps seed remain dry, and the included collet knob keeps the lid in place. Loosen this collet knob and lift the lid to quickly refill or clean the piece. An included, 78" tall, steel pole allows you to display this unit in your yard, and its pointed base and swaged ends make assembly simple. Place the included adapter into the top of the pole once the unit is assembled, to protect it from accumulating rainwater. For even more feeding options, a tube feeder with a threaded base (not included) can be attached to this adapter and filled with different seed. The UV-stabilized, polycarbonate reservoir ensures a durable feeder, for you to enjoy it for years to come. Invite birds to feed throughout the seasons from this Jagunda Squirrel Proof Bird Feeder with Pole. Assembly required. Lifetime guarantee against squirrel damage.